The Cave Diving Group sump indexes are supplementary to the regional caving guides and an invaluable resource and essential reference guide for any UK trained cave diver, researcher or even dry caver looking to better understand the hydrology of British caves. The sump indexes are compiled from many years of exploration reports from CDG members and other contributors. The regional sump indexes summarise the CDG's knowledge (at the time of printing) of the sumps in each of the major caving regions in the UK and when used in conjunction with the regional caving guides. The sump indexes will help to give up to date picture of British caves and their sumps. 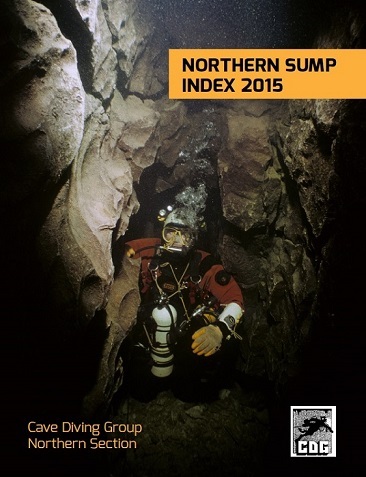 The new Northern Sump Index has been completely re-written and updated to replace the long out of print 1995 edition. This superb new version will be essential reading for anyone with an interest in cave diving in the North of England. The truth of this statement is borne out in the following pages. Researching and visiting more remote sites, making determined efforts to push restricted passages or sites where silt/ poor visibility is common and the development of digging and better belaying techniques have all played their part in the advances that have been made by CDG members during those intervening nineteen years. Of course, many of these efforts could not have been achieved without the support and access given by the landowners at the sites concerned, nor the efforts of the ordinary cavers who carry gear for divers through difficult passages and to remote sumps. To them we are all indebted. It is not easy to single out especially significant advances. But perhaps some of those - explored either recently or by divers in years past - have in turn led to new 'dry' passages being entered, to the benefit of the wider caving community, such as Committee Pot, Illusion Pot and Shuttleworth Pot. Explorations in the passages behind Leck Beck Head, in the Three Counties System, have provided more answers regarding the hydrology and development of the caves in the area. The various leads being pushed behind Keld Head may also prove to be significant and may one day connect to the Three Counties System. Similarly work in the eastern part of the vast network of underwater passages beneath Kingsdale has answered many questions with still more work to be done. In Dentdale the long and deep sumps found beneath the riverbed in Tub Holes provide their own challenges. Beneath Ingleborough the overall depth of the world-famous Gaping Gill System has been extended by the exploration of long, deep sumps. Similar work in Alum Pot and across the valley in Penygent Pot and Gingling Hole has seen small advances deep underground and may yet provide more just rewards for those concerned. In Wharfedale determined efforts digging at the risings at Kilnsey have yet to fulfil their promise whereas at nearby Black Keld and White Keld, significant in-roads have been made towards the elusive link[s] with Langcliffe Pot and Mossdale Caverns. Elsewhere explorations have been thwarted by the effects of floods which move cobbles, shingle and mud deposits, repeatedly destroying and burying guidelines - much to the chagrin of explorers. Perhaps more surprising are those caves in outlying areas of the Dales which have yielded hard-won passage, such as Preacher's Cave. Each time a new Sump Index is produced, thanks to countless hours of research and writing, we may be excused for thinking that the golden era of exploration has been and gone. Instead this record of 'the current state of play' will, I am sure, act as a catalyst for the next phase of explorations.